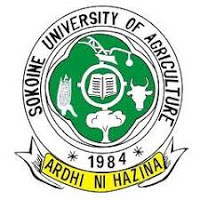 The Management of Sokoine University of Agriculture (SUA) invites suitable qualified Tanzanians to apply for positions listed here below. All applications should be addressed to the Deputy Vice-Chancellor (Administration and Finance), P.O. Box 3000, CHUO KIKUU, MOROGORO two weeks from the date of this re-advertisement. The application letters should indicate names and addresses of three referees, together with certified copies of certificates and transcripts i.e. Form IV, Form VI, Diploma, Bachelor, Masters and Ph.D., Birth Certificate, Curriculum Vitae and testimonials. equivalent (i.e. an average of B+ for BVM and medical graduates) in the First Degree with a minimum score of B+ in the relevant subjects or its equivalent. Lastly, To perform any other duties that may be assigned by the relevant authorities. Remuneration: As per Treasury Registrar’s Circular No. 7 of 2015, which is applicable at the moment. Discipline of Soil Chemistry/ Soil Fertility for applicants in possession of a Master of Science in Soil Science and Land Management/ Soil Science/ Integrated Soil fertility Management with a “B+”in Advanced Soil Chemistry and Soil Fertility related subjects and a Bachelor of Science in Agronomy/ Agriculture General/ Horticulture/ Soil Science from a recognised Institution. Discipline of Irrigation and Water Resources Engineering for applicants in possession of a Master of Science in Water Resources Engineering/ Irrigation Engineering/ Irrigation and Water Resources Engineering or its equivalent and Bachelor of Science Degree in Civil Engineering with a minimum score of “B+” in the relevant subjects. Discipline of Forensic Science for applicants in possession of a Master Degree in Molecular Science/ Genetics/ Evolutionary Sciences and a Bachelor Degree in Wildlife Management/ Zoology/ Biology from a recognised Institution. Discipline of Forest Engineering for applicants in possession of a Master Degree in Forest Engineering/ Agricultural Engineering and a Bachelors Degree in Forestry/ Agricultural Engineering with a minimum score of”B+”in the relevant courses i.e. Forest/ Agricultural Engineering Courses. Experience in teaching, research or Forest/ Agricultural based industries will be an added advantage. Discipline of Veterinary Parasitology for applicants in possession of a MVM/ MVSc in Veterinary Parasitology or equivalent qualification and Bachelor of Veterinary Medicine/ Bachelor of Science in Veterinary Medicine with at least a “B” grade or above in Veterinary Parasitology. Discipline of Pharmacology & Toxicology for applicants in possession of a MVM/MSc in either Veterinary Pharmacology or Veterinary Toxicology and Bachelor of Veterinary Medicine/ Bachelor of Science in Veterinary Medicine with at least a “B” grade or above in Veterinary Pharmacology and Toxicology. Discipline of Veterinary Surgery for applicants in possession of a MVM/ MVSc in Veterinary Surgery and Bachelor of Veterinary Medicine/ Bachelor of Science in Veterinary Medicine with at least a “B” grade or above in either Veterinary Surgery. Discipline of Meteorology for applicants in possession of a Master of Science Degree in Meteorology or relates discipline and Bachelor of Science Degree in Physics and Mathematics/ Environmental Sciences and Management/ Meteorology with a good pass in Atmospheric Physics and Meteoro­logical Instrumentation. The discipline of Theoretical Statistics for applicants in possession of a Masters and Bachelor Degree in Statistics. Discipline of Human Resource Management for applicants in possession of a Masters Degree in Human Resource Management/ Public Administration and a Bachelor Degree in Human Resource Management/ Public Administration/ Political Sciences and Public Administration from a recognised Institution. Discipline of Agricultural Economics (Quantitative Methods and Policies) for applicants in possession of a Master in Agricultural Economics/ Economics with specialization in Quantitative Methods and Policies and Bachelor Degree in Agricultural Economics/ Economics. For applicants in possession of a Bachelor Degree in Library and Information Science/ Information Studies/ Records Management/ Informatics/ Information Technology and related fields and a Masters Degree in Library and Information Science, Information Studies/ Records Management/ Informatics/ Information Technology and related fields. For applicants in possession of a Bachelor Degree in Library and Information Science/ Information Studies/ Records Management/ Informatics/ Information Technology and any related field and a Masters Degree in Library and Information Science/ Information Studies/ Records Management/ Informatics/ Information Technology and any related field from a recognised Institution. Applicants specializing in Knowledge Management and Database Management will be an added advantage. Secondly, Those who applied for similar posts in the past are encouraged to apply. Thirdly, Also, Those working in the Public Service are required to route their applications through their current employers, otherwise your request will not be considered. Fourthly, Those who studied abroad TCU Verification must be attached to the application, otherwise, your request will not be considered. Lastly, During application, the applicant should state the Department, Position and Discipline one is vying for. Source: Daily News 05th December, 2018.